The key USP of the KEY2 is, of course, the 4-row QWERTY physical backlit keyboard with a fingerprint sensor built into the spacebar, just like the KEYone. It bucks the bezel-less display trend and on-screen, features keyboard comprising 35 real keys, offering starved ‘Crackberry’ addicts something tactical to exercise the thumbs against. Durability is another BlackBerry hallmark that returns in the age of delicate, all-glass smartphones. This strengthened aluminum handset with a leather-like soft-touch grip on back is ready for your day, no matter what business you're in. 3. Lots of security features. 1. Worst portrait mode camera yet. 2. 3:2 screen aspect ratio is odd. 3. Won't work with all US carriers. The BlackBerry Key2 is launched in india. The unit offers a 4.5-inch screen (1,620 x 1,080) with a pixel density of 434 pixels per inch and a 3:2 aspect ratio. True to its name, the unit features a physical keyboard, complete with trackpad functionality and fingerprint sensor in the spacebar. BlackBerry has added a new Speed key that helps swap between apps quickly. The smartphone makes use of an octa core Kryo 260, Qualcomm Snapdragon 660 processor that is coupled with Adreno 512 GPU, 6GB RAM and 64GB default memory capacity. This storage can be expanded up to another 256GB with the help of a microSD card. The Key2 is the first BlackBerry phone to come with dual rear-facing cameras. The setup consists of two 12-megapixel sensors: one with a f/1.8 aperture, as well as a secondary f/2.6 lens. The phone claims an improved low-light performance. There’s also 2x optical zoom and a portrait mode. Connectivity aspects on board the mobile include Wi-Fi 802.11 b/g/n, Wi-Fi Direct, hotspot, v5.0, 3.0, Type-C 1.0 reversible connector, USB OTG, with A-GPS and dual sim. It comes with a non-removable Li-Ion 3360mAh battery, supporting Qualcomm Quick Charge 3.0. That will last for two days on a single charge. The smartphone runs on Android 8.1(Oreo), with its own DTEK security app. Regarding sensors, the handset include- fingerprint, accelerometer, magnetometer, gyroscope, proximity, ambient light. It will be available in Indian market in only Black color. 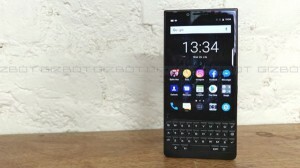 The BlackBerry Key2 is priced at Rs. 42,990 for 6/64GB variant in Indian market. BlackBerry announces KEY2 Red Edition with 6GB RAM and 128GB storage. The BlackBerry KEY2 Red Edition is priced at €779 (Rs 62,789 approx) in the European market and is already up for pre-orders. BlackBerry Key2 new Red color variant launch expected soon. The company is said to unveil the smartphone for the European markets first before releasing it for other regions. Blackberry launches KEY2 LE in India for Rs 29,990. The BlackBerry KEY2 LE sports a 4.5-inch IPS LCD display which offers a screen resolution of 1620 x 1080 pixels. TCL Communication has unveiled the BlackBerry KEY2 LE at the IFA 2018 in Berlin. It is an affordable version of the KEY2 launched earlier this year and comes with a similar design. The device comes in two variants – 32GB and 64GB storage space priced around Rs. 28,300 and Rs. 31,800 respectively.